Happy New Year to all my blog followers! My visit to the Parkinson’s Nurse early in the New Year went well and no need to up the medication which was pleasing. The problems of the dystonia in the left foot are no worse and, indeed, I think I can manage that better than when it first occurred. The local Parkinson’s UK branch is an active and well run group with more than 150 members. I tend to use some of the activities on offer but mostly continue with Pilates, swimming, walking and badminton as I have done for many years. I have been asked if I would be interested in joining the local committee and have agreed, should they need another volunteer. I have noticed that there is a pattern to my weekly life and I think this routine helps my confidence and enables me to carry on quite happily. Change is trickier and can cause anxiety. I am now back in Australia for 5 weeks and have become very aware that it is more difficult to project a confident image. I would love to be an all singing, all dancing grandma to handsome Henry but sadly there are many things I find difficult. He is a very wiggly little boy and doing up straps on push chairs and high chairs is well nigh impossible. Nappy changing needs speed and dexterity which I don’t possess any more. Stories and playing on the floor are fine and persuading a reluctant eater to take just one more mouthful is manageable. Luckily the amiable husband has all the attributes I now lack so we can still make a good team. Outside the amazing Rod Laver arena at the Australian Open tennis. 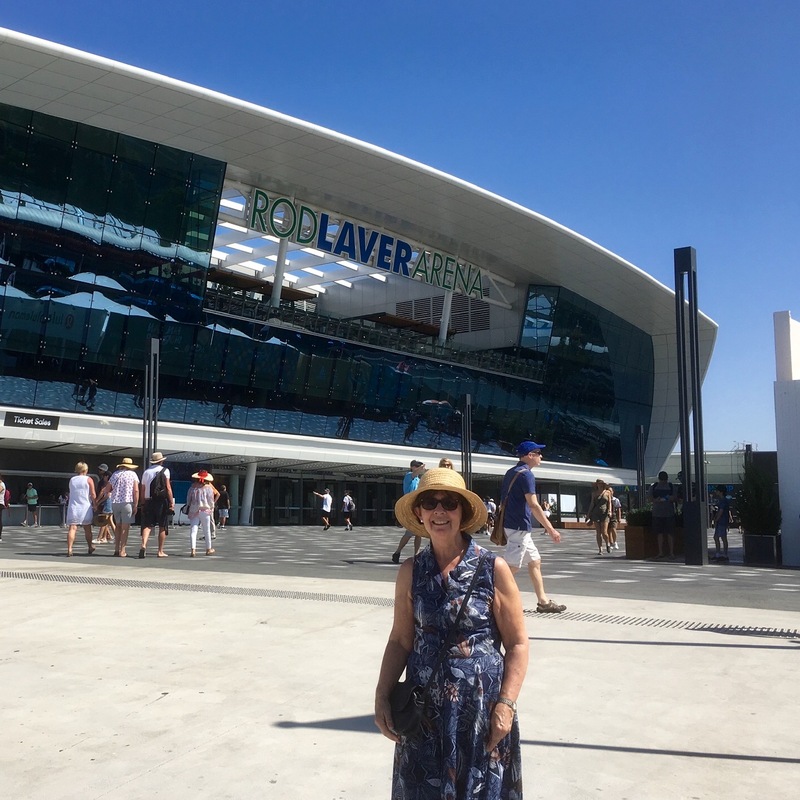 Away from all that we have been making the most of Australia’s summer including a trip to the Rod Laver Stadium to watch the tennis, the first of the Grand Slam. We saw the Ladies semi finals in searing heat, luckily the roof was closed and the air conditioning soon made it wonderfully cool. We were impressed by the stadium and good organisation from all the officials. The cooler weather should be here before this evening so we can be out and about at the Botanical Gardens, the nearby fantastic new play area with water features and making sand castles at Black Rock. As you can tell lots of Grandparent treats, wonderful…. Happy New Year to you both. The lovely photo of you in the sun has brought on deep envy. We had heavy snow here on Tuesday – thankfully it has now disappeared. Our hill was impassable until Wednesday morning!!! I am sure all your activities help you enormously but it must be frustrating not to be able to do everything for Henry. However – isn’t it good that you have such a helpful husband? I would love to have been with you at the tennis. I didn’t know that they had air conditioning in the stadium. How amazing. Have a wonderful time. Enjoy Aus. Elspeth – as if you need telling! I am off to SA from 7 March – 30 April, hence not being able to join you all for lunch on 16th. Hopefully we’ll have another get together in this, our big year! I will be celebrating here on my actual February birthday, then again in SA in both Cape Town, with friends, and Durban, with family. Hi both , envying you the lovely weather. We are expecting a huge dump of snow tonight . My issue is I have arranged a Nordic Walking training session for tomorrow , took weeks to get a date that suited everyone and probably will have to cancel . Have you tried this , very good for balance . We think you are doing a marvellous job with Henry and it builds such lovely memories . See you in the Spring .